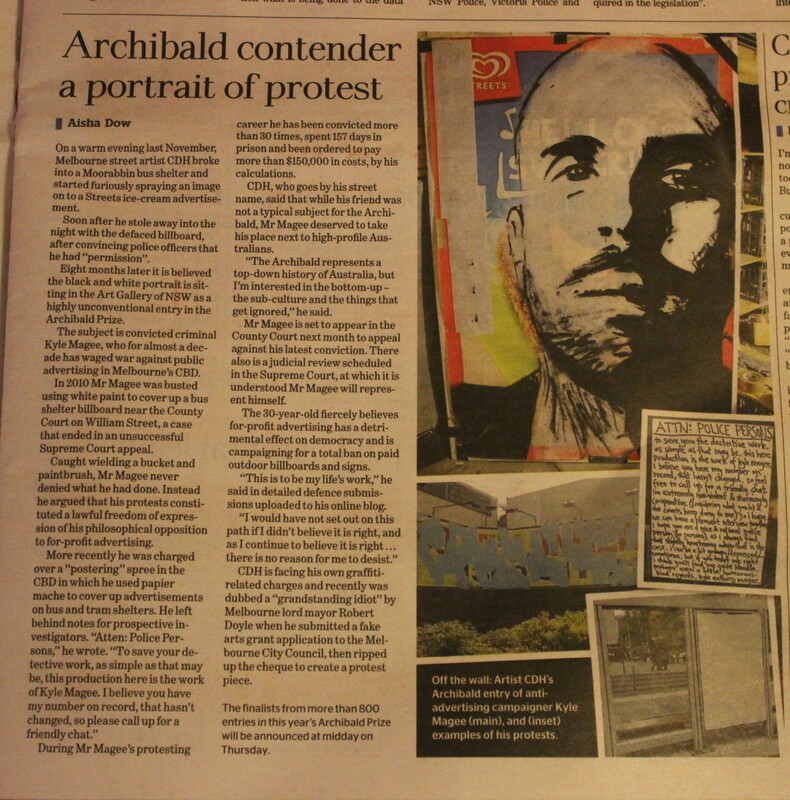 the age — melbourne newspaper and middle-class-liberal cream of the for-profit media swill — ran an article this monday regarding a “highly unconventional entry in the prestigious Archibald prize”: a portrait of my dumb head, sprayed onto a soon-to-be-garbage advertising poster by street artist cdh. the article came about because cdh knew this journalist, aisha dow, and pitched the story to her (after checking if i strenuously objected to him speaking to the age about this, which i did not, i wasn’t going to try and enforce my principles on cdh) — i declined to speak to the journalist of course, as i will always refuse to speak to the for-profit media (they didn’t mention this, just made it sound as if i had spoken to them, which is deliberately misleading and a part of their deliberate failure to mention my objection to for-profit media companies such as themselves). while most people who saw this article seem to see it as an entirely positive thing, and found it exciting that i was “in the paper” and thought it was good for my cause, i don’t share their enthusiasm — the main thing the article showed was that the for-profit media, even in it’s most ‘progressive’ incarnations, will deliberately exclude the pro-social point of this protest and discredit the protagonists by portraying them as wild and anti-social types who are only interesting because they are so zany. “The 30-year-old fiercely believes for-profit advertising has a detrimental effect on democracy and is campaigning for a total ban on paid outdoor billboards and signs.” — implying i believe that outdoor advertising, in and of itself, is the biggest contemporary threat to democracy, a deranged view, that i apparently hold with an equally deranged fierceness. the article fails to explain that i demonstrate against outdoor advertising to express my objection to all forms of for-profit advertising in public space and media, particularly because of such advertising’s role in funding the for-profit media companies that dominate our mainstream media — no room for that simple concept, the space was needed for all the slanderous adjectives that were more central to the ‘unbiased’, ‘balanced’ and ‘accurate’ reporting. the name (global liberal media please), tagline and about page of this website (which the journalist obviously spent a lot of time trawling through) makes the true nature of my protest abundantly clear — to suggest this was left out by anything other than deliberate omission would be to insult the intelligence of the author (who you would imagine, and i am told, is quite intelligent), the structural bias of the for-profit media form is undoubtedly the reason here — i just wonder whether the journalist herself excluded the main point of the protest, or if her editors had to weed that out to make the story ‘fit to print’ (i asked this question in an “off-the-record” email to aisha after the article was published, where i politely(?) vented my displeasure, and i didn’t receive a response, i only heard through cdh that she ridiculed me for thinking some kind of ‘conspiracy’ was going on, fukn lol, i laughed so hard i messed up my tin-foil hat). this refusal to properly explain the simple underlying concept of the protest — coupled with repeated references to lawlessness, the focus on unsubstantial jokes, and the violent connotations of all the descriptive language — seems like a deliberate attempt to cast both cdh and i as incoherent, unrepentant, threatening and comically recidivist criminal clowns, who make ‘trouble’ just for the lulz. the page 3 article was right next to a full page ad for one of the big four banks (trying to bro down with us again) — the age: independent, always — the self-parody would be hilarious if you could forget the consequences. of course a for-profit paper funded by for-profit advertising will never help the cause of media liberation by calling its own integrity into question and pushing for its own abolition — i only hope that journalists themselves begin to believe their compromised positions are untenable, and then join the push for a real public service mainstream media, free of for-profit funding and control, the only arrangement that will enable them to do their jobs with a democratic bias instead of a for-profit one. it’s true that people are able to read between the lines and disregard the typical tone of the for-profit media, which is good, but our lowered expectations and ability to mentally undo the pro-status-quo bias of the for-profit media doesn’t excuse the behaviour — the cumulative effect of our for-profit mainstream media is to turn a realistic view of global politics into a kind of private secret, something which can demoralise and bend even the strongest minds. 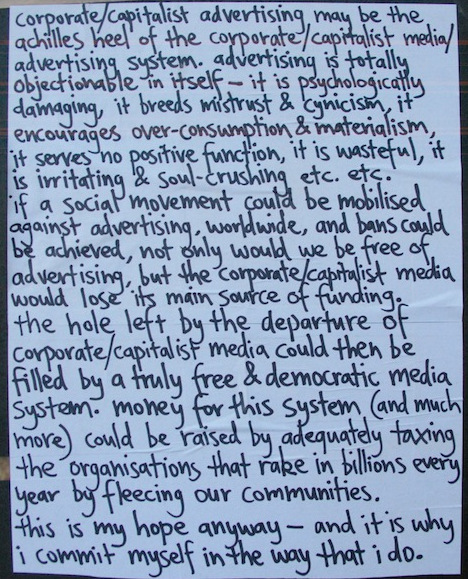 the ultimate irony of this protest is that it is attempting to push the idea that for-profit media system is fundamentally undemocratic into a public sphere that is controlled by for-profit media — not only will this cause receive no help, it will be actively worked against by the established and ‘credible’ for-profit media system that controls our public realm. even though this article trash talks the protest, and those trying to bring awareness to it, in order to turn the earnest events into an amusingly wacky romp — it is still somewhat helpful in spreading awareness of the anti-advertising sentiment expressed (even if its true origin is undisclosed) — i just hope that many readers see through the phony moral judgments of the article and search for this blog to find a real explanation of the protest — but the article couldn’t even make that easy. the article took three photos and several quotes from this website without attributing it by name, which would have enabled interested people to get an extended, and actually accurate, rationale for the protest — i guess the article didn’t want to give me free ‘advertising’, as they turned the earnest actions of my life into light entertainment they could use to sell advertising. the article did however find room to ‘advertise’ both the for-profit company previously advertised on the poster cdh painted over, as well as mentioning the name of the for-profit advertising company who’s advertising panels i have previously covered…. very curious. the age didn’t just fail to properly attribute the photos taken from this website, as well as the photo of the portrait supplied by cdh, they falsely attributed all the photos to an age photographer in the online version of the article — all this from the paper so staunchly against even the most righteous and petty of thefts. some time after the article was first published, the photos were taken down (i’ve looked at many other age stories from that date that still have photos up), i guess because the age realised they had ‘furiously’ misattributed photos, and ‘stolen away into the night’ with their unearned kudos, in violation of my creative commons licensing — this is why i’ve stuck the screenshots of the original online article down the bottom. This is to be my life’s work, I would not have set out on this path if I didn’t believe it right, and if I believe it is right, receiving no arguments or information that could lead me to consider that I may be mistaken, there is no reason for me to desist. the statement was made as a kind of challenge to the judiciary to explain how my actions are deleterious to society — a challenge that would always go unanswered, as when reason is not on the judiciary’s side they present themselves as cold legislation-interpretation machines with no agency whatsoever. the stuffy-arse language i used in the submissions is somewhat of a piss-take on the ridiculous way people within the judicial system write and speak, just like wankars would have 100 years ago — by removing the challenge to explain how i am in the wrong, which extended into the following few sentences in paragraph 12 of the submissions, the edited quote made me look a pompous little gobshite talking about his “life’s work” — well played age, brilliant reporting.